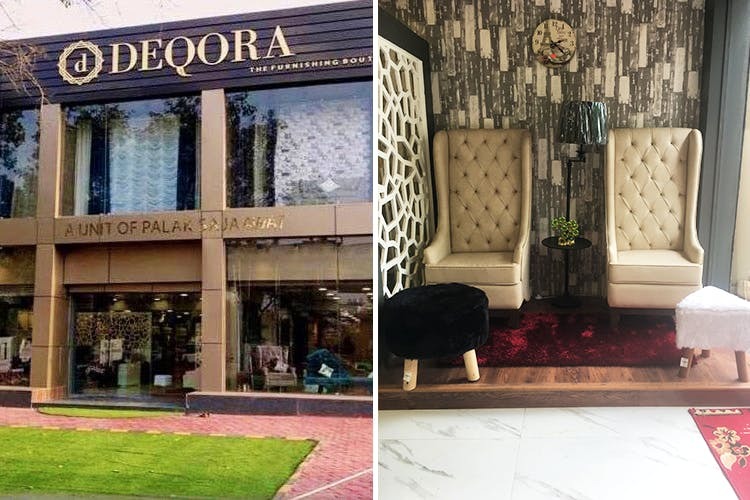 Deqora is a furniture store in Gurgaon which has all your home furnishing requirements, from basics to things to spruce up your home. Customised furniture, bean bag chairs, faux fur stools. They've got all your basics, so if you've just shifted to Gurgaon, you may want to stop by here. They're not exactly cheap, but they're not exorbitantly priced either. They've got duvets starting at INR 1,100 and bright, colourful cushion covers starting at INR 400. They've got fuzzy faux fur stools starting at INR 1,100 (and they'll do it in the colour of your choice). They have plenty of options for curtains and wallpapers, including nice ones that have a more cloth-like texture. Besides these, they have your home basics, bed linens, small tables, sofa sets and more. They also customise furniture for you, so if you like one of their designs, they'll switch it up to suit your preferences. Whether it's their high-back chairs or a low bed, they can change the material used, colours etc. They have some other items like grandfather clocks, hanging clocks, indoor and outdoor water fountains, and a really cool beanbag couch (which we loved). It looks better than a bean bag, and it's comfier than a couch. They also have swanky, automatic blinds in addition to normal wooden ones. We would like more options when it comes to their furniture, but since they're pretty new, we'll let them catch up. They're easy to spot; they're opposite pillar no. 80 when you get out of MG road metro station. There's plenty of parking around, so you won't have to rush your visit.